We have something for every member of the family, young and old. Enjoy the Skeeters with your family and friends from the comfort of a blanket or lawn chair from our grass berm. Constellation Field is equipped with a lobby-style box office which allows fans to purchase tickets in climate-controlled comfort and face-to-face with a TDECU Ticket Office employee. No frustrating conversations through holes in glass ticket windows for our Skeeters fans! Our field box seating bowl area expands from Sections 1 through Sections 26. Every seat in the house has a great view of Sugar Land Skeeters baseball! Constellation Field features privately-owned, fully-furnished, climate-controlled luxury suites with padded balcony seats. Each suite accommodates 25 guests. Suites also have their own restrooms, wet bar capabilities and wait services. Our multi-purpose function rooms allow us to offer the same kind of luxury accommodations to groups on an event-by-event bases. In addition to baseball games, these rooms can be used for luncheons, receptions, holiday parties, sales meetings and other functions year-round. Rooms overlook the field and have balcony seating as well as climate-controlled spaces. Food service, audio/video equipment, internal sound systems and the ability to subdivide spaces to accommodate various group sizes from 25 to 100 people. 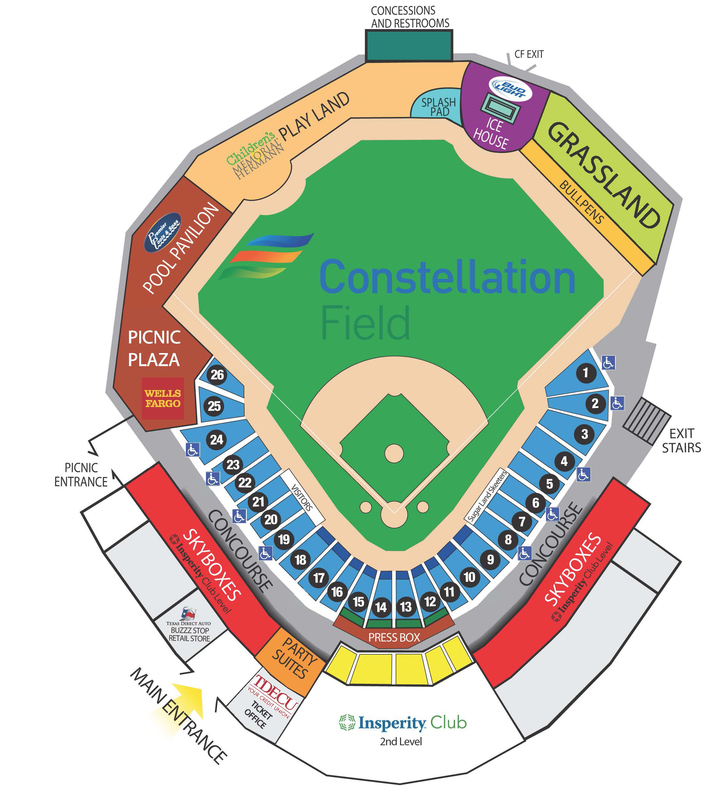 Constellation Field features a picnic plaza that accommodates up to 500 patrons, includes access to an in-ground pool, and offers buffet-style food services. The Wells Fargo Picnic Plaza is frequently used for company picnics, class reunions, church outings and more! The Premier Pools and Spas Pavilion is an extra-unique feature of Constellation Field located in the Wells Fargo Picnic Plaza. It is a great feature for hosting a birthday party at the ballpark! Picnic ticket is necessary to access the pool. Located in the first two rows between the dugouts, these premium seats are fully padded, theater-style chairs with armrest cup holders. Some sections also have tables between seats for your convenience. These seats are the closest to home plate, providing up-front views. As a premium seat holder you also receive access to the climate-controlled Insperity Club which features a gourmet buffet with carving station, salads, appetizers, entrees, special menus, and desserts. In addition, popcorn, peanuts and non-alcoholic beverages are always available free of charge. A true Texas tradition awaits Skeeters fans outside the right center field wall. The Bud Light Ice House provides an excellent view of the playing field and a destination for fans to socialize and grab one of their favorite ice cold beverages. The Bud Light Ice House is the “go-to” spot for happy hours and entertainment. Take in America’s favorite pastime from your premium seats behind home plate on the private skybox level. These premium seats are directly outside the climate-controlled Insperity Club. Insperity Club gourmet dining, which is included in the premium season tickets at no extra cost (excluding alcoholic beverages), features an extensive buffet with carving stations, salads, appetizers, entrees, special menus and desserts. In addition, popcorn, peanuts and non-alcoholic beverages are always available free of charge. Like no other seat at the ballpark, the Rouxpour Diamond Deck features rocking chairs located directly behind home plate. Our ballpark also includes an extensive park for children of all ages to play on. Just outside the centerfield wall, the Children's Memorial Hermann consists of our state-of-the-art Sport Court of Texas, playground equipment, and a splash pad. Access to the Children's Memorial Hermann Play Land is free to anyone with a ticket. The retail shop, located at the front gates of the stadium, features all of the latest trending Skeeters for all fans! A true Texas tradition awaits Skeeters fans outside the right-center wall. It's the "go-to" spot for happy hours and entertainment at Constellation Field! Providing a great outdoor patio atmosphere, the Bud Light Ice House features an excellent view of the playing field, open patio seating, and an outdoor grill that serves up the tastiest menu items Constellation Field has to offer. The Bud Light Ice House provides a relaxing destination for fans to socialize and grab one of their favorite ice cold beverages. Just beyond the centerfield wall, the Children’s Memorial Hermann Play Land provides entertainment options for children of all ages! The Play Land includes a variety of jungle gym equipment and slides, a state-of-the-art Sport Court of Texas, and splash pad. The Rouxpour Diamond Deck is like no other seat at Constellation Field! It's the perfect setting for a casual night at the ballpark! Located directly behind home plate and in front of the press box, the Rouxpour Diamond Deck allows you to enjoy the entire game from the comfort of a Leigh Country Furniture rocking chair. For questions regarding the Rouxpour Diamond Deck, please contact one of our friendly Skeeters customer service representatives at 281-240-4487 or email tickets@sugarlandskeeters.com. To purchase tickets, please call the TDECU Ticket Office at 281-240-4487 or purchase tickets online. For questions regarding the Diamond Deck, please contact one of our friendly Skeeters customer service representatives at 281-240-4487 or email ticket@sugarlandskeeters.com. To purchase tickets, please call the TDECU Ticket Office at 281-240-4487 or purchase tickets online at www.ticketreturn.com. Take in America's favorite pastime from your premium seats. These premium seats are located directly outside of the climate-controlled Insperity Club on the second level of Constellation Field (directly behind home plate). The Insperity Club offers gourmet dining, which is included in your premium season ticket package at no extra cost (excluding alcoholic beverages). The extensive buffet options include carving stations, salads, appetizers, entrees, special menus and desserts. In addition, popcorn, peanuts and non-alcoholic beverages are always available free of charge. Situated at the front of this 6,000-square-foot space is a full-service bar area. The Insperity Club is also perfect for your next banquet, meeting or party! With a seating capacity for up to 300 people, the large banquet space with natural lighting and striking view of the field is an ideal location. The Wells Fargo Picnic Plaza is the ideal location for your next group, family or company outing! With seating for up to 500, the expansive shaded area features mouth-watering favorites and the fabulous Premier Pools & Spas Pool Pavilion. The Wells Fargo Picnic Plaza also gives you easy access to the Children’s Memorial Hermann Play Land, the Bud Light Ice House and the main concourse. Group guests enter through an exclusive picnic entrance and enjoy a two-hour, all-you-can-eat buffet with a variety of food and drink options.